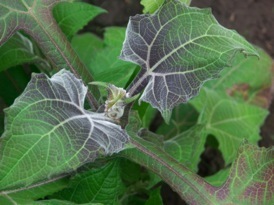 Yacon is a tender perennial plant, but is grown as an annual in climates with winter frosts. 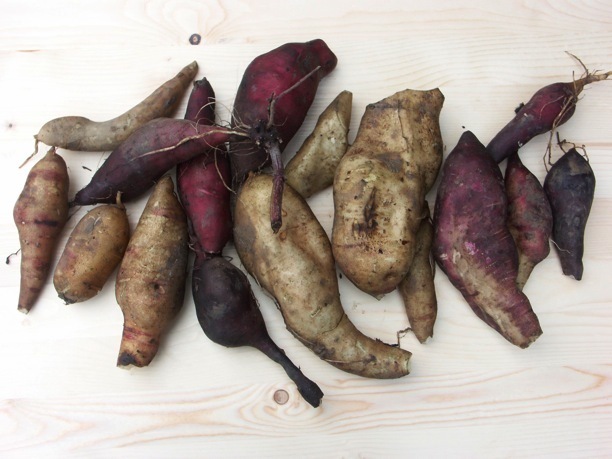 They produce a very big rootstock, consisting of two types of tubers: root tubers are big and crunchy , they are the ones that are eaten. 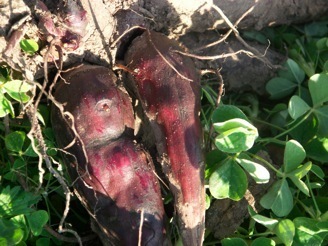 The other, small tubers, are stem tubers, and grow near or even on the stalk. 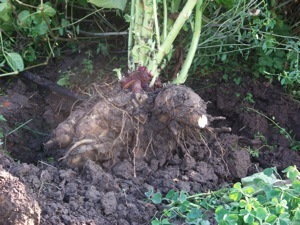 These sometimes tiny stem tubers are the ones being used for replanting. They can be planted from the end of February in small pots, making sure they are in a frost-free place. They do not support any frost! The small pots can be placed on a windowsill, a greenhouse, or anything similar. They prefer a light spot and like to receive quite a bit of water, temperatures around 18-22 degrees Celsius suits them best, they don’t like very high temperatures (35+ degrees). The plants will grow steadily until they can be planted outside, in Western Europe this is usually the second half of May. Planting can be done in any kind of soil, although, it seems they do want a little bit of organic matter when you have a sandy soil. 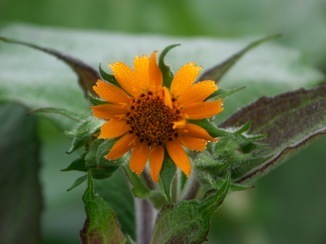 I always grew them on a loam soil, I never added anything, but my ground is very rich. 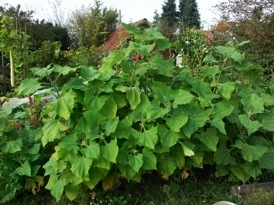 They take up a lot of space, give them about 90 cms. space . A sunny spot is preferred, although a little bit of shade doesn’t seem to harm the plants. It takes some time before they fill out this place, they should have done that by the end of August. I give them a sturdy support, this is certainly necessary in a windy spot. They can become very big: depending on the summer, I’ve had heights from 1,80 to 2,40 metres! The plants are happy in rainy summers, in dry summers they want a bit of extra water, or , better, cover the ground with hay or straw or…(be careful, however, some mice love to eat the tubers and are very happy under this protective cover). Tuberisation normally begins by the end of August, the plants seem to speed up their growing by that time. Dig them up when the first frosts have struck (October, November or even later). 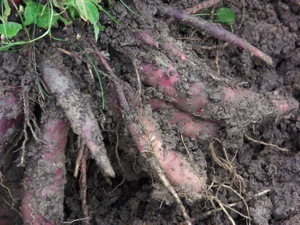 Lift them carefully with a fork, the brittle tubers are very easily damaged (although I am fully aware of this, I always end up with some broken tubers).Do not divide or split the plants. 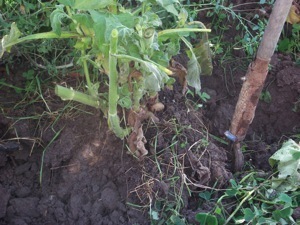 I don’t remove the stems until they are lifted out of the ground, it’s easier to lift the plants. I lift the plants (they can be heavy, 20 kgs. 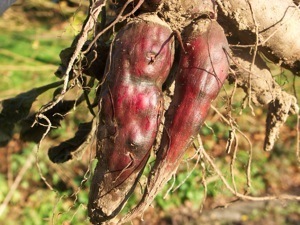 is not really exceptional) and put them in a plastic or wooden box with some drainage holes in it, I don’t remove the ground between the tubers (‘my’ loam ground acts as some sort of a glue anyway), and carry the boxes to their conservation place, after cutting the stems to a height of about 10 cms. A good place for storing them is a potato cellar or anything similar, keep them frost-free!. The tubers become sweeter after storing, this can take up to three or four weeks,( I always place the broken tubers in the greenhouse, sun curing speeds up the sweetening process). Storage is much better when some sand or peat or even compost is put around the tubers, it’s in fact, some sort of replanting, you can also use very big plastic or stone tubs, or anything else that’s convenient. 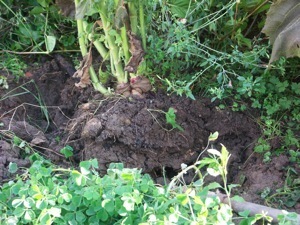 With this sand or peat cover, tubers can be stored until next summer. Because the sweetening process seems to go better without adding sand or anything else, I only add a potting medium after three or four weeks. I didn’t experience any specific diseases,only slugs and mice like the plants and/or tubers. Tubers are peeled and eaten raw or cooked, I prefer them raw, but they are a very good additive to spaghetti sauce or pizza,or…A short cooking time insures they remain crunchy and tasty.